This event is set up with registration by unit. Unit leaders are responsible for registering Scouts and Crew members from their unit and for registering Webelos that their unit invites. Please provide email addresses for Scoutmasters and SPLs so we can communicate with units to provide additional information and camporee plans. If there are individual Webelos who want to come, please contact Ray Rustem. He can match Webelos with participating units. Cost: $15 youth, $10 adults if paid by September 30th. Fee covers program materials, patch, recognition, insurance, administration. Fee does NOT cover food. Units are responsible for own food. Each patrol and crew will use scout skills to escape a number of out-of-doors rooms. 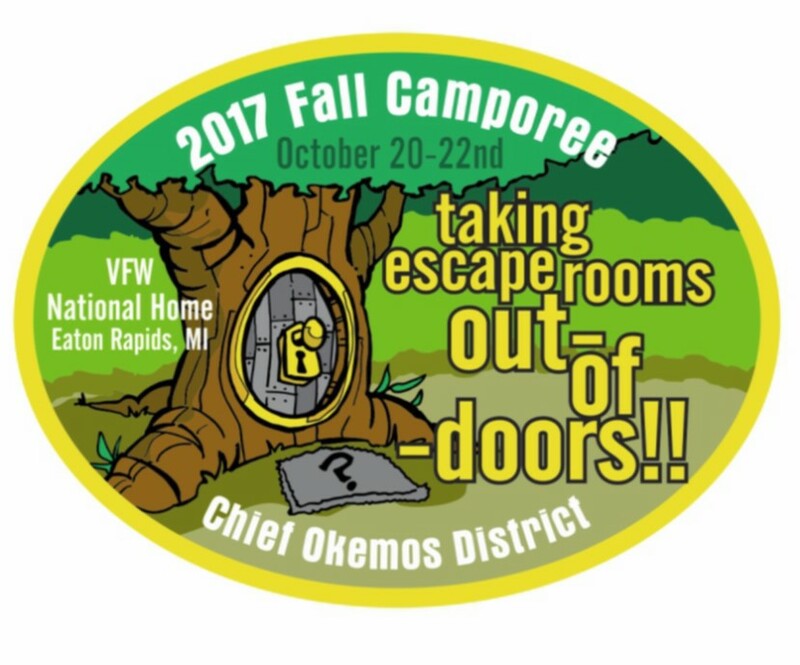 With each escape, patrols and crews will receive a clue to solve the camporee puzzle. Patrols / crews solving the puzzle will receive awards! Troops need to bring all the gear necessary to set up their own campsite: tents, dining tables, dining fly, cooking stoves, first aid kit, water and food storage containers. Bring navigation devices i.e.. compass, GPS unit and/or cell phones w/ GPS and compass software. Units will supply their own food and make arrangements for feeding the Webelos Scouts you invite. No ground fires will be allowed. There will be a Friday night cracker barrel for Scoutmasters and Senior Patrol leaders, Saturday night campfire with skits, and Sunday morning Scouts Own and awards presentation. Bring your health form and uniform. No walk-ins. Here are directions to the VFW National Home. From SOUTH US127 Take EXIT 56 toward Bellevue Rd/Leslie. Turn left onto W Bellevue St. Take W Bellevue Rd. 6.09 miles, turn right onto Onondaga Rd. Then 1.01 miles, turn left onto Kinneville Rd. Then 2.04 miles, turn right (N) onto S Waverly Rd. Then 0.23 miles to VFW home on right.